Kenya has proposed to set up a gold refinery in the west of the country to help small scale miners and the government is seeking consultants to advise on its construction, the Petroleum and Mining Ministry said on Friday. Kenyan mines have proven deposits of titanium, gold and coal but its mining sector is a relatively small contributor to national output. 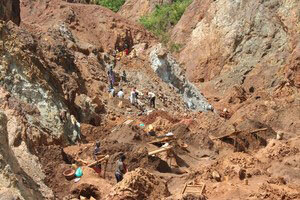 Nonetheless, revenues are expected to grow as new mines start production. The ministry said in a statement that the new refiner will provide services to help vulnerable, artisanal and small scale miners and other local producers to meet international standards. "The aim of the project is to improve the livelihoods of the beneficiary community, regional economy and that of Kenya as a whole." Despite being a small gold producer, Kenya has attracted investors like London-listed Goldplat Plc, which operates a mine in south western Kenya.